Between 2011 and 2014, while humans were discovering dubstep and the wonder of selfies, Greenland was melting fast. It lost a trillion tons of ice in just three years, and the world neither noticed nor gave a damn. 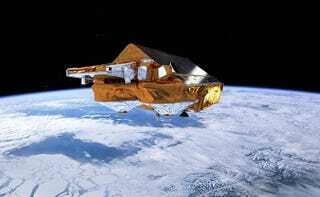 That’s according to a new, open-access study published in Geophysical Research Letters, which used the European Space Agency’s CryoSat satellite, along with regional ice models, to show that recent melting of the Greenland ice sheet contributed twice as much to sea level rise (roughly 2.5 millimeters over the study period) as the prior two decades. In other words, Greenland—which has been visibly losing ice since the ‘90s—is melting at an accelerating rate. This falls right in line with the picture Earth scientists have built by studying past ice sheet contractions. Namely, when ice starts melting, it doesn’t go in a plodding, linear fashion. It disintegrates quickly, resulting in large pulses of sea level rise over short periods of time. One such pulse 12,500 years ago wound up adding approximately 50 feet to global mean sea level within three to four centuries. The Intergovernmental Panel on Climate Change predicts roughly three feet of sea level rise this century, while NOAA predicts somewhere between four and six and a half feet. But these estimates don’t fully account for the feedbacks that cause ice sheet melt to accelerate, leading some scientists to suspect they are very low. We’ll just have to wait and see how the planetary experiment plays out this time around. As geologist Hal Wanless of the University of Miami pointed out to me in a recent conversation, sea level was roughly 420 feet lower 18,000 years ago than it is today. At that time, atmospheric carbon concentrations were only 180 parts per million—100 ppm lower than they were at the start of the Industrial Revolution. Now, over less than two centuries, we’ve pushed the atmosphere permanently north of 400 ppm.